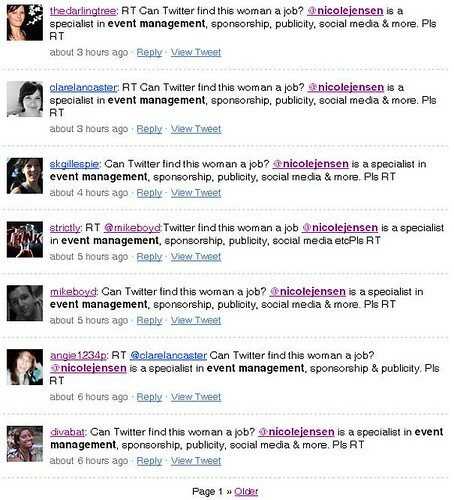 This afternoon, the lovely people on my Twitter list decided to help me in my search for employment! Huge thanks to Clare Lancaster for starting this chain of tweets and to all who did RT. You're all fantastic. Including those who have brainstormed with me and linked to never-ending Twitter job searching sites. There will be some creative methods to "find this woman a job" coming about soon! In other news, Twestival is on all over the world on Thursday. Have you bought your ticket yet? Come and join us at the Brisbane Twestival for fun, games, great entertainment and good times; all raising much-needed funds for those thirsty in the world. I'm so excited!